The ANETD IPSCM is an 8in IP speaker embedded into a white 2 foot by 2 foot frame so it can be dropped in place of a standard ceiling tile in a typical drop ceiling. 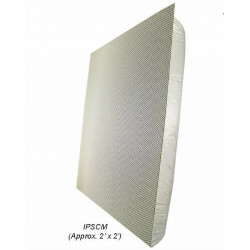 The ANETD IPSWS-SM-IC is an 8in IP speaker embedded into a white 12" x 12" surface mounted wall hanging. It includes a built in microphone for 2 way talkback. Informacast Compatible. 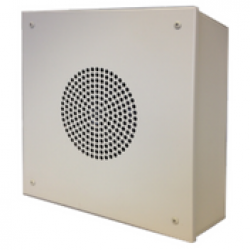 The ANETD IPSWS-FM-IC is an 8in IP speaker embedded into a white 12" x 12" flush mounted wall hanging. It includes a built in microphone for 2 way talkback. Informacast compatible. 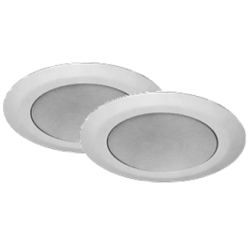 The ANETD IPSCM-RM-IC is a 2 speaker set including an 8 inch round IP Ceiling speaker and an 8in analog speaker which feeds from the ceiling speaker giving you twice the coverage for a fraction of the cost of installing 2 IP speakers. Informacast compatible. The ANETD IPSCM-IC is an 8in IP speaker embedded into a white 2 foot by 2 foot frame so it can be dropped in place of a standard ceiling tile in a typical drop ceiling. It is compatible with Informacast. The ANETD Outdoor IP Speaker is an outdoor PoE speaker that allows you to bring the power of your IP Paging network outdoors. The ANETD IPSWS-FM is an 8in IP speaker embedded into a white 12" x 12" flush mounted wall hanging. It includes a built in microphone for 2 way talkback. 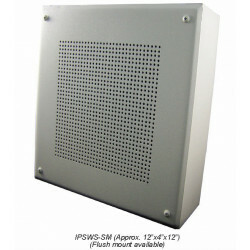 The ANETD IPSWS-SM is an 8in IP speaker embedded into a white 12" x 12" surface mounted wall hanging. It includes a built in microphone for 2 way talkback. The ANETD IPSCMRM is a2 speaker set including an 8 inch round IP Ceiling speaker and an 8in analog speaker which feeds from the ceiling speaker giving you twice the coverage for a fraction of the cost of installing 2 IP speakers. The ANETD IPSWS-SM-O-IC outdoor IP Speaker is an outdoor PoE speaker that allows you to bring the power of your IP Paging network outdoors. Informacast Compatible.